Scaredy Squirrel is a 2-D animated cartoon series by Nelvana, based (very) loosely on the book series of the same name. To celebrate April Fools' Day on Friday, April 1, 2011, YTV aired a special sneak peek episode of Scaredy Squirrel in Canada. 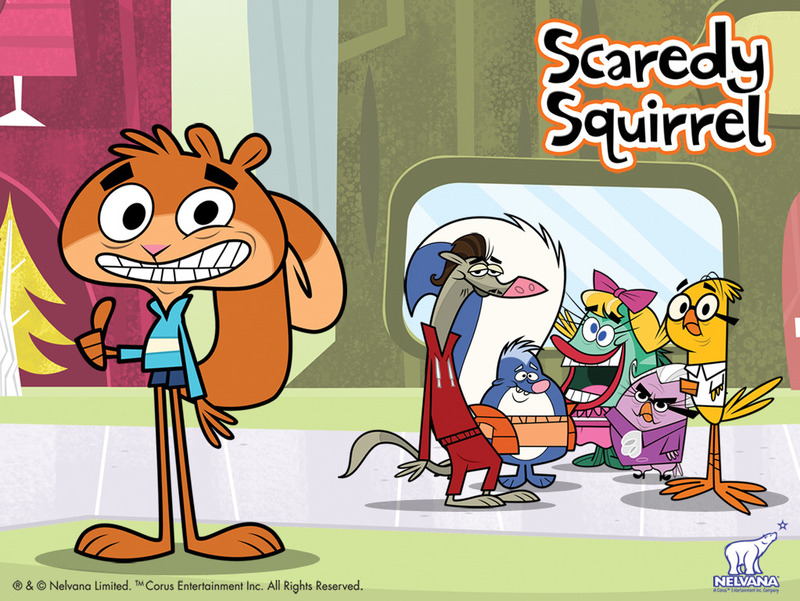 Then on Sunday, April 3, 2011, YTV officially premiered Scaredy Squirrel at 9:30 a.m. EDT. The series premiered on Cartoon Network in the United States on August 9, 2011, at 7 p.m. EDT. Cartoon Network gave up on it after only a few months, however it recently started airing reruns on Qubo and Starz, and continues to air in Canada. The show's protagonist is a Super OCD squirrel named Scaredy who works in a supermarket. His best friend is a Fat Idiot skunk named Dave. Adipose Rex: Scaredy turns into one of these during the nut bar episode. Even Dave admits Scaredy has got a problem. Adorkable: Scaredy and to a lesser extent, Dave. Aerith and Bob: Dave, Nestor, Sally, Mildred and... Scaredy? Alliterative Name: Scaredy Squirrel and Paddy Padderson. Ambiguously Gay: Dave shows signs of it. He has a somewhat lispy voice and he was totally cool with wearing a pink princess dress in one episode. Apathetic Teacher: The Paddleball Camp Master in the episode "Camp Or Consequences" is one. Artifact Title: Scaredy lived up to his name in the original books. In the TV series he's hardly ever scared. Ax-Crazy: Nestor, his mom and Paulie. Scaredy gets one as a result of eating a lot of nutbars. Dave's stomach inflates like a balloon due to not spraying in "Where The Stink At". The B Grade: In "Dreamweaver" when Scaredy gets a rating of "BAD" on his performance review. Barefoot Cartoon Animal: Nearly every character in this series is one! Honestly, it'd be easier to list the characters that aren't barefoot! One episode subverts this. Scaredy puts on 5 layers of socks, finishing with a shoe that makes it look like he's barefoot. Beard of Evil: As revealed in "There Is No "I" In Groceries", the Sorta Fresh grocery store is a parallel store to the Stash N' Hoard, where everyone (except Scaredy) has an evil double with a goatee. Even Dave, who doesn't even work at the Stash N' Hoard. Breaking the Fourth Wall: This exchange after a Cutaway Gag from "From Rodent With Love". Also routinely in the Safety Corner lessons at the end of the episode. Brick Joke: The "donkey detector" from "From Rodent With Love". Broken Aesop: While the show is usually Aesop-rich, at least one episode (the one with the golden paddle ball) has the characters not learn the lesson obviously set up, with Dave dropping a similar but unrelated aesop, then both lessons forgotten in the next few seconds. Chained Heat: Nestor and Scaredy in "The Tubtastic Tuo"
Cloud Cuckoolander: Dave and sometimes Scaredy. Cool Toy: Parodied in "Snerd Envy", where the toy everyone in town but Scaredy has is completely plain and useless. And then again when Scaredy convinces the rest of the characters that he has an invisible one. They follow him at first until he fesses up... but then wins them back when he has the cool new "Mr. Handy Hand" (just googly eyes placed on his hand). This episode also leads to a subtle Aesop about using your imagination. Companion Cube: Scaredy has a plant named Richard whom he talks to. It might even be his pet. Continuity Nod: In "From Rodent With Love", Scaredy says to Mildred, "How can you know how to do all this crazy stuff and still pack eggs at the bottom of a grocery bag?" In an earlier episode, "Suggestion Box Blues", Mildred did indeed pack some eggs at the bottom of a bag. Couch Gag: Scaredy always says something different at the end of the Theme Tune. Did I Just Say That Out Loud? : Sally, repeatedly. Sally: "I won't let you talk that way to the man I love! ...to... coach. Awkward." The Ditz: Nestor and King Nutbar. The Dragon: Paddy, Paulie and the Paddleball camp master. Evil All Along: Nestor's Mother in "Halloweekend". Fat and Skinny: Dave and Scaredy. Zig-zagged with Sally the fish. Her fins are relatively normal shape and don't suddenly morph into hands, but she still plays Tailfin Walking straight. Nestor's arms are normally very short when at his side. They tend to grow as needed, though. Freudian Excuse: Nestor constantly puts down others in a desperate attempt to hear his mother tell him she's proud of him. Fun with Acronyms: Subverted with SNERD. Furry Confusion: Scaredy has a plant for a pet named Richard, and Dave adopts a cactus he names Jose, then there's Sally, a trout, who has a pet... cat? Scaredy: "How am I going to get to the top of that tree?" Dave: "Maybe you could scamper up the side? You know... like a squirrel?" Scaredy: "I think you're gonna have to launch me." George Jetson Job Security: Scaredy's gotten fired a few times; but it's more potent among employees such as the donkey and Buck, who get fired by Nestor and his mother on a regular basis, yet show up in the next episodes as if nothing happened. Getting Crap Past the Radar: The "juice box" gag in "Camp Or Consequences". In the episode "Sticky Situation", one of the interpretive signs that Nestor gives Scaredy involves him squatting down and shaking his tail feathers. "Stick it in your blow hole!" Sally: "Picture me in my underwear... DO IT!" -cue image of Sally in pink undies and a bra, lying on Scaredy's bed, surrounded by candles and stroking her hip. Scaredy: Why were you hiding in my shower? Gonk: Nestor, Paddy and Mildred aren't the most... attractive-looking animals, to put it lightly. Half-Dressed Cartoon Animal: Dave, Nestor and most of the supporting cast. Apparently Dave does not wear pants because when skunks spray, it tends to destroy their pants. Hypnotic Eyes: The Paddleball Camp Master in the episode "Camp Or Consequences" does this to control the campers and Dave to do what he wants. Inflating Body Gag: Happens to Mildred near the end of "From Rodent With Love" in order to save Balsa City's water supply from being stolen by evil otters. Lampshade Hanging: Scaredy likes to question some of the insanity that surrounds his life. In Name Only: There is literally nothing in common between the books and animated series save for the character being a squirrel with fears. Granted, there was very little they could do if they played the source material straight, so Tropes Are Not Bad. Plus, Mélanie Watt, who wrote the books, is a creative consultant on the show. Jerkass: Nestor. The way he treated Scaredy in "The Madness Of King Nutbar" won't help matters. Also his mom. Kids Are Cruel: Particularly in the episode, "Camp Or Consequences". K-I-S-S-I-N-G in a Tree: Dave to Scaredy after he swoons over Sue, in his own special 'Dave' way: "Scaredy and Girl Scaredy sitting in a tree! K-I-S-S-S-S...uhhhhh"
Manchild: Just about everyone in town. Mundane Made Awesome: In-universe, paddle-ball is a competitive sport. No Cartoon Fish: Averted. Sally is very definitely a fish. Noodle People: The entire cast, except Dave. Our Zombies Are Different: Zigzagged in "Aisle of the Damned". During a heat wave, everyone who drinks the Brain Freezer turns into a zombie. Scaredy deduces that they aren't really zombies, but just hot. Turns out the Brain Freezer machine was set on zombie mode. Satellite Love Interest: Subverted, maybe, with Sue, the "girl Scaredy". Despite appearing (briefly) in the opening credits, she has only been in one episode, and thanks to theatrical superstitions, she turned into an Abhorrent Admirer. Paddleball Camp Master is a snake who hypnotizes Campers. Nestor hits Scaredy with a mop in the style of a black hammer. Sitcom Arch-Nemesis: Nestor and Paddy to Scaredy. Slippery Swimsuit: Scaredy pulls this prank on Paddy in "Mr. Perfect Balsa". Suspiciously Specific Denial: "I really hope it works out for you! I'M NOT JUST SAYING THAT!" Technicolor Toxin: Dave sprays a purple cloud. The Ending Changes Everything: The ending of "Stack to School" is one big Homage to The Usual Suspects. After failing multiple times to show that he can be spontaneous, Scaredy passes his spontaneity class by racing to and performing a daring rescue at the Stash n' Hoard. It's only after Scaredy receives his diploma and leaves that his teacher realizes that Scaredy had orchestrated the entire thing (and therefore wasn't spontaneous at all). Trademark Favorite Food: Scaredy loves nutbars. Those Two Guys: Buck and Hatton.